Our one bedroom guest house, rents by four day minimum, weekly, or one month maximum which is negotiable during the stay if desired, and features a King Sized Bed, and balcony for that morning coffee or bird watching. A short walk to the Main House will put you beside the large private pool complete with showers and washroom facilities. Temperatures range from 25 to 32 degrees Celsius which holds the pool temperature comfortable for swimming, floating or massaging with the Jacuzzi Jets while sipping your favorite beverage. The Property is beautifully landscaped and maintained. Rooms have A/C and remote control ceiling fans, cable TV, and high speed internet. Located 45 minutes from Juan Santamaria International Airport and the newly developed area of Escazu and Santa Ana, for those who want to shop. The beaches of Herradura & Jaco are 45 minutes away for golfing or surfing, or for walking or biking on the beach a short drive to Esterillos. Keywords: Flat bungalow on beautiful landscaped acerage in fruit producing region. Grace and Ivan live full time on the property where we keep busy with the Landscaping, and maintenance. I am Costa Rican and Ivan is Canadian, we love Costa Rica for it's friendly people and abundant plant and animal life. After living in Canada for 28 years and raising two children, my Husband and I decided it was time to leave the Cold White North and find some peace, tranquility, and warmth. After travelling the country we decided to settle in the San Mateo area, the property produces avocados, mangos, lemons, oranges, star fruit, and attracts an abundance of exotic birds and wild life. There are many amenities within a short drive from the property, beaches, golf, sport fishing, surfing, boating, restaraunts, shopping, crocodile watching, adventure parks, which can be enjoyed on day trips. Then the tourist hustle can be left behind while you rest beside the pool and plan your next adventure. Full bathroom at the pool with large shower sink and water closet. Local calls free, International at cost, Skype is also available. Two 18,000 BTU split units, one in the Master Bedroom and one in the Livingroom/Kitchen. Heat is not required at any time of the year. All sheets, pillows and pillow cases, and bed spreads are provided. Separate laundry room with initial supply of detergent and softener. Located in the laundry room, and separate area for hanging outside if prefered. Fire pit for wood burning outside if desired. A large covered car port is detached from the house. Wireless internet, or wired high speed broadband. Treadmill, and multi station equipment available, ask owner. Seats 4 comfortably, same area as the kitchen. The carport is large enough for a car, Rv, and boat trailer. 22 cubic ft, complete with ice and filtered cold water dispenser. Four burner gas complete with oven. All utensils required to satisfy culinary artists. Complete with initial supply of coffee and filters. Initial supply, paper towels, spices, cleaning supplies. Enough to serve a minimum of 8 people. Upon request, contact owner for local cuisine. Blender, double sink, under sink waste disposal, ceramic water filter, granite counter tops, all necessary utensils. Most prefer to eat on the deck, as it is very comfortable, or can be seated at the kitchen counter. 80 cable channels English and Spanish, plus numerous radio and music stations. Foosball table is by the pool. Cards and chess are available. Wide variety of genres available. Pool toys and floats are provided. There is 1 & 1/3 acres of garden, plants, & fruit trees. With view, breeze and birds. 300 square feet with nice view of sun sets, and cool evening breeze. The nearest Golf course is Los Suenos, 50 km from the property. Two steps to enter with extra wide doors to all rooms. With jacuzzi jets and water temperature ranging from 70 to 80 degrees F Year around. Jacuzzi jets attached to pool, national and private parks for hiking, bird watching, horse back riding, gondola, canopy tour on zip lines, superman zip line, all within 30 minutes of the property. Deep sea fishing within 45 minutes of the property. Beautiful spot - Highly recommend! Grace and Ivan's casita was perfect for what we wanted / needed. The Casita itself is spacious and set far enough back from the main house that privacy is not an issue. Our hosts Grace and Ivan Lund are exceptional to the max - they speak both English and Spanish and are pleased to help with anything - and were even kind enough to be our tour guides on a couple of outings. We highly recommend this Casita for anyone wanting to stay in that area. their stay act promptly to requests. Joanne, a salad spinner has been added. Wonderful guesthouse! Relax and enjoy! We would absolutely stay again at Grace's Guesthouse! The owners/hosts ~ Ivan and Grace Lund are "great people"! Kind, friendly, funny, extremely helpful and also very knowledgeable about the area. Grace's Guesthouse ~ the 'casita' ~ has personality, charm, and privacy. 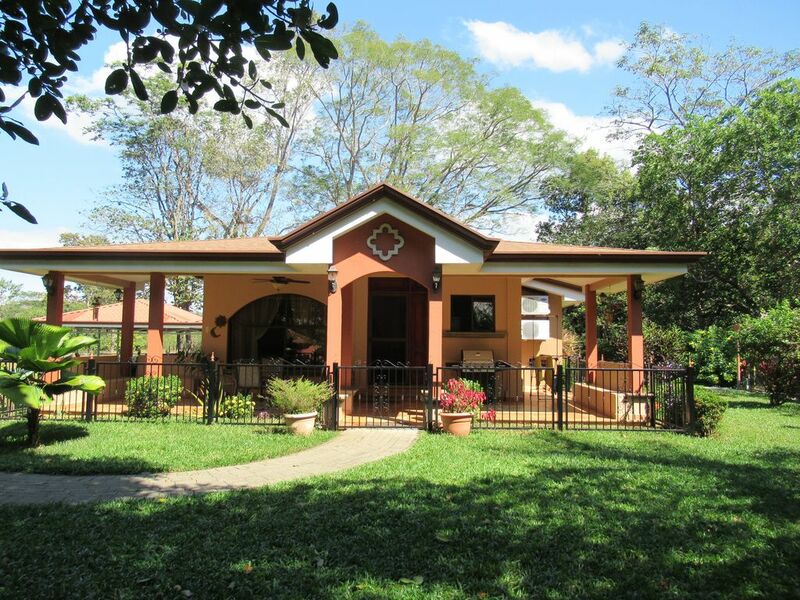 The casita and property are extemely well maintained, beautifully decorated and landscaped. Whether you stay a week or four weeks as we did the casita has all you will need and if you're missing something or have a question just check with Grace, Ivan or their 'right-hand man' Tao! There is a very handy laundry room in the casita, covered carport just steps away, and a wonderful covered veranda to sit out on ~ for meals, reading, listening/watching for the many birds, visiting with Ivan, Grace or Tao, or watching the amazing sunsets. The pool is just a short walk down a paved path which is partially shaded by an enormous tree! The pool is large and very well maintained. It is great for floating or lap swimming! The pool area has deck chairs, pool floats, music, and a convenient changing room/bathroom. Grace's guesthouse was very convenient for us as it was a quiet place to enjoy time by the pool and convenient to travel to many sights ~ National Parks of Manuel Antonio and Carara, Rainmaker Conservation Project and the LaPaz Waterfall Gardens just to name a few we went to. We were also able to take a 5 mile hike right from the casita, shop at a local farmers market in San Matteo, shop in Orotina, meet some of Grace's wonderful family, and eat at several local sodas. We woke many mornings to the sounds of howler monkeys, roosters, and owls! With the help of Tao we saw green iguanas, different lizards, and a variety of birds. To top it all off we enjoyed making friends with Ivan and Grace's six dogs ~ ALL very well behaved! We were greeted each morning with a tail wag!! Tim and Kim were wonderful Quests and the type of travellers any property owner would love to entertain, we would be delighted to have them return, well knowing there are many places in the world to see and so little time in the next 100 years to get there. We wish them all the best in their future endeavours. Leave the Cold behind, Winter in the Safe Quiet Paradise of Costa Rica is exactly right! We spent two weeks at Grace and Ivan’s Casita and it was “Paradise”. Firstly, Grace and Ivan are just amazing they made sure we were comfortable and treated us just like family. They invited us to their traditional family Christmas dinner, which was amazing in itself and such a pleasure to meet their family! The casita is surrounded by beautiful trees, plants and flowers and inside was just as beautiful and so comfortable. It has everything you need (even an ice maker, rice cooker, blender, it’s all there) and the Apple TV was perfect for us “Winnipeg Jets Hockey Fans”. Keith and Ivan had so much in common especially when it came to hockey and Keith really enjoyed chatting with Ivan (often to the point of interrupting his work day :)) We also really enjoy having their dogs around, they are all so friendly and love to be around people. We did have a vehicle as we were travelling to various parts of CR but Grace and Ivan were more than willing to drive us to different places, which was great as they are so knowledgeable about the area and can recommend things to do and see. Great hosts and tour guides! We have formed a friendship with Grace and Ivan and will be returning to their Casita on our next trip to CR! World travelers, interested in everything, easy going , undemanding, Kieth and April were wonderful guests. I didn't know Winnipeg had a hockey team until Kieth and I watched a rather one-sided wash against Edmonton. I wish them both health and happiness in their future travels and really look forward to seeing them again if they should return to Costa Rica. Perfect for first time Costa Rica travelers! We thoroughly enjoyed our stay! We chose not to arrange transportation due to the high cost of the rental and fuel (they pay by the liter not the gallon). Ivan is an alertive and conscientious driver. We were not used to the driving there but got acquainted with it really quickly. Thanks to Ivan's driving skills, this was/is no concern. Ivan and Grace took us around to all of the spots we requested and helped us time our leaving so we would not get rained out as we came on the tail end of the rainy season and it rains very early in the afternoon. They charged us a very reasonable fee and saved us a ton on the transportation costs. The guest house is incredibly charming and the pool was great. We don't typically care for dogs, but their dogs are very friendly, mellow, and greeted us at the gate every day we returned. We really enjoyed ourselves and are thankful we stayed with them, as there were a lot of unknowns we would have been challenged with without their assistance. We even had the chance to hang out with their delightful friends and family. I highly recommend staying with them if you are looking for an authentic experience and need someone to hold your hand through the experience. Thank you Ivan and Grace! God bless. Freddy and Serobia were a delightful couple, interesting to talk to, and very polite, appreciative, and easy to please, would love to have them back in the future. Our casita was left as if no one had stayed there, making ready for our next guests a breeze. Grace and I wish them well in all their future endeavours. This was our last stop on our three week CR getaway. It was awesome to meet the property owners and visit about life in Costa Rica. They provided us with information about tours and places to dine. We decided on Volcano Poaz but I forget about the advice to wear long pants and take a jacket but still glad we went. The views are up close and there is a small museum in the park. We also did the Calypso Tortuga Island Tour out of Puntarenas. We had a great time starting with breakfast and ending with the sunset. The casita is spacious, well stocked, comfortable, secure, and beautiful. The property is full of native trees and plants. It was cashew harvesting season and I was was happy to learn all about it. I loved the flavor of the natural nut and fruit. Our guests Larry and Lisa were wonderful, well traveled, and knowledgable of common interests, such as organic gardening, we wish their stay was longer, and hope they return in the future, and maintain their positive energy and karma in their future endeavours . It is always gratifying for Grace and I to hear positive responses to this very beautiful and diverse country of Costa Rica. Grace and Ivan were excellent hosts, right from the beginning when they met us at the airport. It was a long day of travelling, and they ensured we started our vacation without a hitch. We accompanied them out for dinner our first night, which was also a great experience, and we revisited that particular restaurant again. The casita was very comfortable, we loved dining on the front patio. The kitchen was well equipped with everything we needed to make our meals. I loved the great drinking water, and the ice machine. The yard was very well maintained, and the amazing tree in front of the casita provided us with many enjoyable hours of bird watching. The location was great for many day trips, and there were lots of things we got to see thanks to the great tips we received from our hosts. The pool was also wonderful. I loved having the dogs around, they are so well behaved, and for anyone who didn't want to interact with the dogs, there is lots of fencing. I, however, found it very comforting to have them around, and to be greeted each day with wagging tails. I was quite attached by the time we left!! All in all, it was one of our best holidays, Grace and Ivan made us feel very welcome, they went above and beyond to ensure that our vacation was wonderful, and I highly recommend their casita!! Brian and Jane were wonderful guests, well travelled, interesting conversation, and eager to see as much as possible of this beautiful country. Grace and I would love to see them back.